This column was written by Matthew Continetti. The schedule for June 7 said Rudy Giuliani would address the 38th annual meeting of the Airport and Seaport Police at 8 p.m. at a Marriott hotel here in downtown Washington. Campaign and event staff said not to hurry, however. Giuliani routinely begins his events late, and in this case he had to attend a fundraiser at the Hard Rock Café downtown, where GOP senator David Vitter of Louisiana was introducing him. After that, he was to arrive at the Marriott and accept the first-ever Fred V. Morrone Memorial Award. Morrone was superintendent of the New York and New Jersey Port Authority police when he died inside the World Trade Center on September 11, 2001. Giuliani knows how to make an entrance. After the somber police officers emceeing the award ceremony go through their introductions, the former New York City mayor enters through a side door, accompanied by his two-man security detail and a few staff members. (Giuliani has five security guards; two of them are with him at all times.) The audience, almost all men and almost all wearing dark suits, rise for a standing ovation. Giuliani delivers his speech, saying Morrone was a hero who "found himself on the front lines of a war of terrorists against us." The delivery is smooth, but you can tell the candidate hasn't spent much time with the text. Giuliani keeps looking down at the words on the lectern. The audience doesn't seem to mind. They applaud at the appropriate moments and nod their heads when Giuliani criticizes the Senate immigration deal and evokes the horrible events of September 11, 2001. "Political correctness cannot stop us from describing clearly, and seeing clearly, our enemy," Giuliani says. He outlines two programs — BorderStat and PortStat — that would track the government's progress in maintaining border and port security. Then he's done. He poses for a few photos, seeks out former Homeland Security undersecretary for border and transportation security Asa Hutchinson for a handshake, and leaves by the side door through which he came. Giuliani won't be available to the press, a communications aide tells disappointed reporters. The mayor will spend the night in D.C. and leave the next day. If you've ever thought there's a fly-by-the-seat-of-one's-pants feeling to the Giuliani presidential campaign, you are probably right. None of Giuliani's senior staff — campaign manager Mike DuHaime, senior adviser Tony Carbonetti, political director Mark Campbell, and communications director Katie Levinson — has much experience in presidential politics. An aide says Giuliani is playing catch-up, having made a relatively late entry into the race. 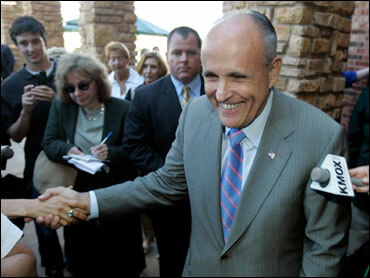 Compared with the hyperorganized campaign of former Massachusetts governor Mitt Romney, Giuliani's is haphazard. Sometimes schedules are handed out just 24 hours before the events in question. Statements from the candidate or senior staff happen on the order of a few a week, not the constant barrage of e-mails that come from Team Romney. Giuliani is just beginning to assemble policy advisory groups in the areas of health care, energy, Iraq and the Middle East. Former Indianapolis mayor Stephen Goldsmith and Stanford economist Michael Boskin are key domestic policy advisers, while Harvard's Stephen P. Rosen and Yale's Charles Hill handle foreign policy. Over the last few weeks Giuliani has outlined programs for restoring accountability to government and making health care more competitive and health insurance more individualized. He rarely delivers speeches from a prepared text, preferring to extemporize from notes. The candidate's worst — and best — moments are unscripted. A few months ago Giuliani got himself into trouble over conflicting statements on federal funding for abortions. Conservatives and the press criticized his performance at the first GOP debate, when he seemed ambivalent about the future of Roe v. Wade. Still, Giuliani's attack on Rep. Ron Paul at the second GOP debate was also unscripted. And his humorous, ad-lib response when lightning struck outside the debate hall during his answer on an abortion question last week disarmed the audience. It's an unconventional moment in American politics, and Giuliani is an unconventional candidate. "This is an unprecedented campaign," says a longtime conservative activist. It's the first time since 1952 that there is no incumbent president or vice president running in either party. There's also no clear front-runner. The failure of the more conventional conservative candidates to connect with voters, combined with Giuliani's assured presence on the stump and in debates, has left the GOP race open to hizzoner. For now, it simply doesn't seem to matter that his campaign isn't as well organized as some of the others. There are challenges, however. "Giuliani is trying to throw conventional wisdom out the door," says a GOP lobbyist sympathetic to John McCain. This was brought home once again last week, when campaign manager DuHaime said the mayor would skip the August 11 straw poll in Ames, Iowa. It was a difficult decision. It's been the subject of debate inside the campaign for months. The carnival-like straw poll is a fundraiser for the Iowa GOP. It costs millions of dollars for the campaigns to bus in supporters from throughout the state. Right now Giuliani has neither the staff nor the resources in Iowa to compete in Ames. Last week, there were "more than 12 people" in the state working for Giuliani, says a senior aide. That's not exactly what you call an army. What's more, DuHaime opened Giuliani's Iowa headquarters and named the campaign's state chair only last week. The sudden announcement a few hours later from the McCain campaign that the senator would also skip Ames surprised Team Giuliani. They took it as a sign McCain's campaign is ailing. Giuliani still faces two problems in Iowa, however. The first is that no candidate in the last 30 years has ignored Ames and gone on to win the Iowa caucuses in January. Yet Giuliani aides say the mayor still plans to compete in the caucuses. Which leads to the second problem: Giuliani and McCain will remain on the straw poll ballot in August. They won't do well, which could demoralize their Iowa supporters preparing for January. Skipping Ames could be the first step toward leaving Iowa altogether. And that could lead to more problems. Giuliani strategists believe their candidate's national celebrity, strong fundraising, and proven ability to appeal to disaffected independents and Democrats lend him a strong advantage in primaries in Florida, California, New York, Michigan, and Pennsylvania. With the new, frontloaded primary calendar, those states will all vote within a few weeks of Iowa, New Hampshire, and South Carolina. Giuliani seems to be banking on a January 29, 2008, Florida win to propel him to the next round of big-state primaries on February 5. "The calendar has changed things an awful lot," says the senior Giuliani aide. Here's the question: Does the frontloaded primary schedule make the first contest, Iowa, either more or less important? One longtime GOP strategist thinks it will be more important. The bounce the winner(s) of Iowa, New Hampshire, and South Carolina will receive should not be underestimated. The risk for Giuliani is that after Iowa comes New Hampshire, and candidates who have held statewide office in Massachusetts tend to overperform there. Think Dukakis in 1988, Tsongas in 1992, and Kerry in 2004. You can even go back to Amb. Henry Cabot Lodge winning New Hampshire in the 1964 Republican primary. So that favors Romney. Then there's South Carolina. Voters there tend to go along with caucus-goers in Iowa — and the winner in Iowa and South Carolina is more likely to determine the GOP nominee than the winner in New Hampshire. In 1996, Bob Dole won Iowa, lost New Hampshire to Pat Buchanan, then won South Carolina and went on to receive the nomination. In 2000, George W. Bush won Iowa, lost New Hampshire to John McCain, then won South Carolina and went on to become the nominee. The historical record suggests it's difficult to win the nomination without winning two of these three states. The Giuliani campaign seems willing to risk testing that proposition. Giuliani is unusual in other ways. The most prominent is his stance on abortion, which is not only pro-choice but also seems to be pro-Roe v. Wade. If Giuliani were to win the nomination, he would be the first GOP nominee in more than 30 years to hold these positions. Gerald Ford typically is cited as the last pro-choice Republican nominee, but the history is more complicated than that. The 1976 GOP platform was explicitly anti-Roe, but Ford himself was more equivocal. He said that he opposed abortion and that Roe had been wrongly decided, though he opposed a constitutional amendment to return the issue to the states. Betty Ford's strong support for abortion rights further complicated her husband's position and has shaped the historical record. After his performance in the first GOP debate, when he seemed ambivalent and confused on abortion, Giuliani steadily lost ground in national GOP polls. Now those numbers appear to have stabilized. In some cases they've improved. The media attribute this to Giuliani's May 11 speech at Houston Baptist College, where he unequivocally supported abortion rights and civil unions for gay couples. The truth is the May 11 speech said little that was new, and Giuliani's stabilizing in the polls more likely can be attributed to his good performance in subsequent debates and his success at guiding the campaign back onto national security and economic policy terrain. A good day for Giuliani is when no one talks about social issues. In the meantime, the peculiarities pile up. Giuliani would be the first Italian American to win the presidential nomination of either party. He would be the first Catholic ever to win the GOP nod. He would be the first former mayor to win a presidential nomination since Theodore Roosevelt. He would be the first GOP nominee to have supported Mario Cuomo for state office. All of this has never happened before. But I hear there's a first time for everything.